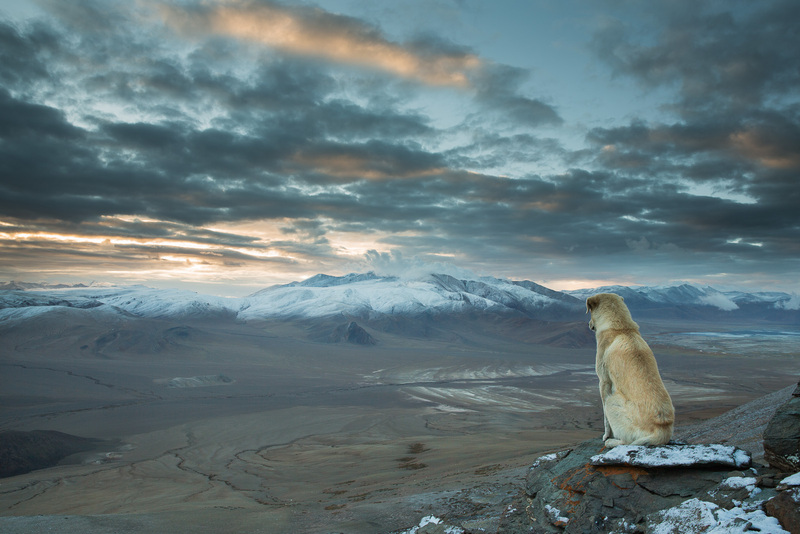 Things have gone wild recently regarding this photo of the ‚Himalayan dog‚ aka ‚winter is coming‚. And since thousands of people keep asking questions on what happened to this dog, I set up this blog to give an answer. 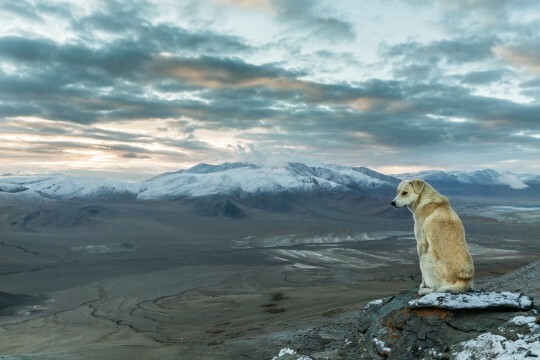 The dog showed up in the beginning of an 8 day trek in Ladakh | India close to the Tibetan border. He appeared out of nowhere – in a region that is except it’s vast mountain landscape very remote – and kept following our small group of 6 people. First we tried to ignore him for a while since we didn’t want him to follow us all the way, but he just didn’t want to give up. After realizing that he had no intention to stop following our group, we started to feed him. Since the nights where pretty rough—with temperatures far below 0° Celsius (32 F) and additional snowstorms—we let him sleep in our foretent. In return he guarded us. For example one time, we built our shelter in a nomadic camp surrounded by other rather unfriendly dogs. He kept chasing them away from us the whole time we were there. I know, it sounds a bit like a romantic drama as you could expect in the fictional movie but on this occasions we were glad to have him. It was obvious that the dog was used to the rough conditions and the high altitude up to 5600mASL. It was quite funny watching him running around, chasing marmots while we were catching our breaths. And even though this dog did not have the slightest chance of caching them, he never gave up. His endurance was impressing. The dog was not only friendly and a good companion, he was clever too. I had the impression that he liked his role as a watchdog. My guess would be that he is used to follow people on this trek, guarding them in return for food – it is probably his way to make a living. Guarding for food. Fair enough. I had my feeling affirmed when a guy sent me images of the very same dog after he recognized the dog on the image on REDDIT. He was accompanied by him one month before us hiking in the same place. For the viral image itself: Well it’s actually said already. My intention on that morning was to get early enough on the top of the next 5000m peak to take some shots of the whole countryside at sunrise. It was still dark while I was ascending the mountain and it took a while for me to realized that the dog had followed me again. On the top I set up my tripod and took some shots when I suddenly noticed the dog sitting on the place next to me gazing in the countryside, totally quiet. The dog didn’t show any intention of leaving his spot. So what I did, was that I tried to integrate the dog into my morning-landscape image. Et voila – You have seen the rest. 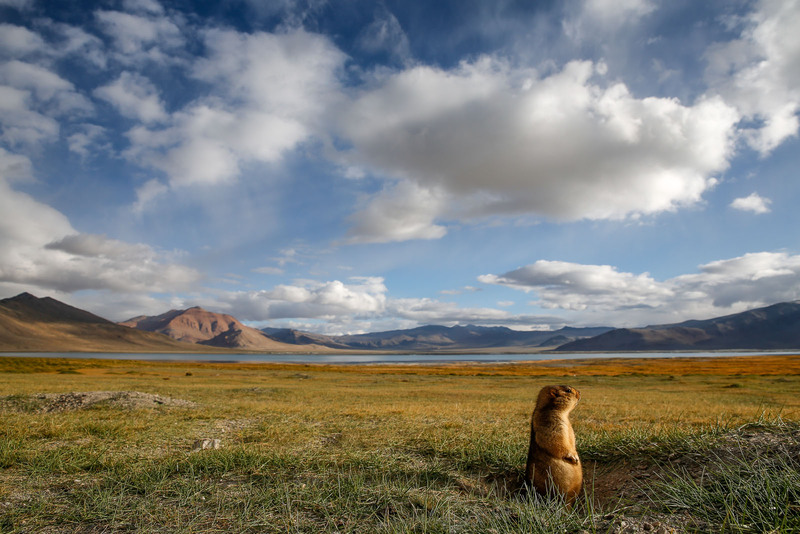 After this shot the dog accompanied us five more days and followed us the whole way to the end of the trek – Korzok, a small village on the shore of lake Tso Moriri. And of course we were debating and wondering what will happen to the dog at the end of our little journey but it turned out that this questions are just the way humans are thinking. In the end, the dog made this decision by itself. He disappeared as fast as he had appeared . We spent a whole day and night in the small village but the dog had left our camp soon after our arrival and never showed up again. 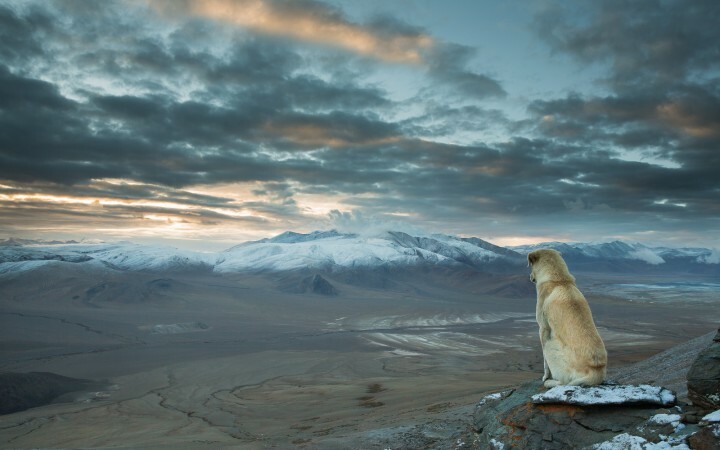 We went on with our trip the following morning and headed for the next adventure conquering high altitudes and I believe the dog probably did the same thing following the next random group of people leaving for a trek in the mountains. I will leave you hear maybe in the same way the dog left us. There is nothing more I can tell you. But I have the feeling it is not the last time we have heard of this special dog and I’m sure someone else will go there and meet him as well.